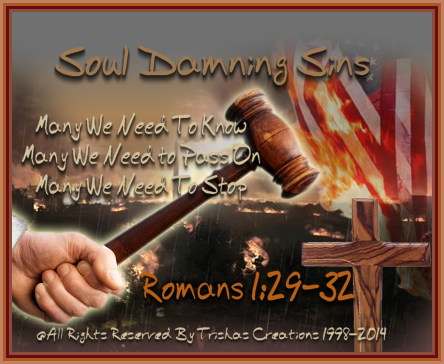 Welcome to "Soul Damning Sins"
Matthew 7:19-21 -- 19 Every tree that bringeth not forth good fruit is hewn down, and cast into the fire. 20 Wherefore by their fruits ye shall know them. 21 Not every one that saith unto me, Lord, Lord, shall enter into the kingdom of heaven; but he that doeth the will of my Father which is in heaven. Romans 1:29-32 -- (KJV) 29 Being filled with all unrighteousness, fornication, wickedness, covetousness, maliciousness; full of envy, murder, debate, deceit, malignity; whisperers, 30 Backbiters, haters of God, despiteful, proud, boasters, inventors of evil things, disobedient to parents, 31 Without understanding, covenant breakers, without natural affection, implacable, unmerciful: 32 Who knowing the judgment of God, that they which commit such things are worthy of death, not only do the same, but have pleasure in them that do them. 1 Corinthians 6:9-10 -- (KJV) 9 Know ye not that the unrighteous shall not inherit the kingdom of God? Be not deceived: neither fornicators, nor idolaters, nor adulterers, nor effeminate, nor abusers of themselves with mankind, 10 Nor thieves, nor covetous, nor drunkards, nor revilers, nor extortioners, shall inherit the kingdom of God. Galatians 5:19-21 -- (KJV) 19 Now the works of the flesh are manifest, which are these; Adultery, fornication, uncleanness, lasciviousness, 20 Idolatry, witchcraft, hatred, variance, emulations, wrath, strife, seditions, heresies, 21 Envyings, murders, drunkenness, revellings, and such like: of the which I tell you before, as I have also told you in time past, that they which do such things shall not inherit the kingdom of God. Ephesians 4:17-32 -- (KJV) 17 This I say therefore, and testify in the Lord, that ye henceforth walk not as other Gentiles walk, in the vanity of their mind, 18 Having the understanding darkened, being alienated from the life of God through the ignorance that is in them, because of the blindness of their heart: 19 Who being past feeling have given themselves over unto lasciviousness, to work all uncleanness with greediness. 20 But ye have not so learned Christ; 21 If so be that ye have heard him, and have been taught by him, as the truth is in Jesus: 22 That ye put off concerning the former conversation the old man, which is corrupt according to the deceitful lusts; 23 And be renewed in the spirit of your mind; 24 And that ye put on the new man, which after God is created in righteousness and true holiness. 25 Wherefore putting away lying, speak every man truth with his neighbour: for we are members one of another. 26 Be ye angry, and sin not: let not the sun go down upon your wrath: 27 Neither give place to the devil. 28 Let him that stole steal no more: but rather let him labour, working with his hands the thing which is good, that he may have to give to him that needeth. 29 Let no corrupt communication proceed out of your mouth, but that which is good to the use of edifying, that it may minister grace unto the hearers. 30 And grieve not the holy Spirit of God, whereby ye are sealed unto the day of redemption. 31 Let all bitterness, and wrath, and anger, and clamour, and evil speaking, be put away from you, with all malice: 32 And be ye kind one to another, tenderhearted, forgiving one another, even as God for Christ's sake hath forgiven you. Ephesians 5:3-21 -- (KJV) 3 But fornication, and all uncleanness, or covetousness, let it not be once named among you, as becometh saints; 4 Neither filthiness, nor foolish talking, nor jesting, which are not convenient: but rather giving of thanks. 5 For this ye know, that no whoremonger, nor unclean person, nor covetous man, who is an idolater, hath any inheritance in the kingdom of Christ and of God. 6 Let no man deceive you with vain words: for because of these things cometh the wrath of God upon the children of disobedience. 7 Be not ye therefore partakers with them. 8 For ye were sometimes darkness, but now are ye light in the Lord: walk as children of light: 9 (For the fruit of the Spirit is in all goodness and righteousness and truth;) 10 Proving what is acceptable unto the Lord. 11 And have no fellowship with the unfruitful works of darkness, but rather reprove them. 12 For it is a shame even to speak of those things which are done of them in secret. 13 But all things that are reproved are made manifest by the light: for whatsoever doth make manifest is light. 14 Wherefore he saith, Awake thou that sleepest, and arise from the dead, and Christ shall give thee light. 15 See then that ye walk circumspectly, not as fools, but as wise, 16 Redeeming the time, because the days are evil. 17 Wherefore be ye not unwise, but understanding what the will of the Lord is. 18 And be not drunk with wine, wherein is excess; but be filled with the Spirit; 19 Speaking to yourselves in psalms and hymns and spiritual songs, singing and making melody in your heart to the Lord; 20 Giving thanks always for all things unto God and the Father in the name of our Lord Jesus Christ; 21 Submitting yourselves one to another in the fear of God. 1 Timothy 1:8-17-- (KJV) 8 But we know that the law is good, if a man use it lawfully; 9 Knowing this, that the law is not made for a righteous man, but for the lawless and disobedient, for the ungodly and for sinners, for unholy and profane, for murderers of fathers and murderers of mothers, for manslayers, 10 For whoremongers, for them that defile themselves with mankind, for menstealers, for liars, for perjured persons, and if there be any other thing that is contrary to sound doctrine; 11 According to the glorious gospel of the blessed God, which was committed to my trust. 12 And I thank Christ Jesus our Lord, who hath enabled me, for that he counted me faithful, putting me into the ministry; 13 Who was before a blasphemer, and a persecutor, and injurious: but I obtained mercy, because I did it ignorantly in unbelief. 14 And the grace of our Lord was exceeding abundant with faith and love which is in Christ Jesus.15 This is a faithful saying, and worthy of all acceptation, that Christ Jesus came into the world to save sinners; of whom I am chief. 16 Howbeit for this cause I obtained mercy, that in me first Jesus Christ might shew forth all longsuffering, for a pattern to them which should hereafter believe on him to life everlasting. 17 Now unto the King eternal, immortal, invisible, the only wise God, be honour and glory for ever and ever. Amen. 1 Timothy 4:1-8 (KJV) 4 Now the Spirit speaketh expressly, that in the latter times some shall depart from the faith, giving heed to seducing spirits, and doctrines of devils; 2 Speaking lies in hypocrisy; having their conscience seared with a hot iron; 3 Forbidding to marry, and commanding to abstain from meats, which God hath created to be received with thanksgiving of them which believe and know the truth. 4 For every creature of God is good, and nothing to be refused, if it be received with thanksgiving: 5 For it is sanctified by the word of God and prayer. 6 If thou put the brethren in remembrance of these things, thou shalt be a good minister of Jesus Christ, nourished up in the words of faith and of good doctrine, whereunto thou hast attained. 7 But refuse profane and old wives' fables, and exercise thyself rather unto godliness. 8 For bodily exercise profiteth little: but godliness is profitable unto all things, having promise of the life that now is, and of that which is to come. 1 Timothy 5:11-13 -- (KJV) 11 But the younger widows refuse: for when they have begun to wax wanton against Christ, they will marry; 12 Having damnation, because they have cast off their first faith. 13 And withal they learn to be idle, wandering about from house to house; and not only idle, but tattlers also and busybodies, speaking things which they ought not. 1 Timothy 6:3-10 -- (KJV) 3 If any man teach otherwise, and consent not to wholesome words, even the words of our Lord Jesus Christ, and to the doctrine which is according to godliness; 4 He is proud, knowing nothing, but doting about questions and strifes of words, whereof cometh envy, strife, railings, evil surmisings, 5 Perverse disputings of men of corrupt minds, and destitute of the truth, supposing that gain is godliness: from such withdraw thyself. 6 But godliness with contentment is great gain. 7 For we brought nothing into this world, and it is certain we can carry nothing out. 8 And having food and raiment let us be therewith content. 9 But they that will be rich fall into temptation and a snare, and into many foolish and hurtful lusts, which drown men in destruction and perdition.10 For the love of money is the root of all evil: which while some coveted after, they have erred from the faith, and pierced themselves through with many sorrows. 2 Timothy 3:1-13 -- (KJV) 1 This know also, that in the last days perilous times shall come. 2 For men shall be lovers of their own selves, covetous, boasters, proud, blasphemers, disobedient to parents, unthankful, unholy, 3 Without natural affection, trucebreakers, false accusers, incontinent, fierce, despisers of those that are good, 4 Traitors, heady, highminded, lovers of pleasures more than lovers of God; 5 Having a form of godliness, but denying the power thereof: from such turn away. 6 For of this sort are they which creep into houses, and lead captive silly women laden with sins, led away with divers lusts, 7 Ever learning, and never able to come to the knowledge of the truth. 8 Now as Jannes and Jambres withstood Moses, so do these also resist the truth: men of corrupt minds, reprobate concerning the faith. 9 But they shall proceed no further: for their folly shall be manifest unto all men, as their's also was. 10 But thou hast fully known my doctrine, manner of life, purpose, faith, longsuffering, charity, patience, 11 Persecutions, afflictions, which came unto me at Antioch, at Iconium, at Lystra; what persecutions I endured: but out of them all the Lord delivered me. 12 Yea, and all that will live godly in Christ Jesus shall suffer persecution. 13 But evil men and seducers shall wax worse and worse, deceiving, and being deceived. 2 Timothy 4:1-4 -- (KJV) 4 I charge thee therefore before God, and the Lord Jesus Christ, who shall judge the quick and the dead at his appearing and his kingdom; 2 Preach the word; be instant in season, out of season; reprove, rebuke, exhort with all long suffering and doctrine. 3 For the time will come when they will not endure sound doctrine; but after their own lusts shall they heap to themselves teachers, having itching ears; 4 And they shall turn away their ears from the truth, and shall be turned unto fables. Hebrews 12:12-17 -- (KJV) 12 Wherefore lift up the hands which hang down, and the feeble knees; 13 And make straight paths for your feet, lest that which is lame be turned out of the way; but let it rather be healed. 14 Follow peace with all men, and holiness, without which no man shall see the Lord:15 Looking diligently lest any man fail of the grace of God; lest any root of bitterness springing up trouble you, and thereby many be defiled; 16 Lest there be any fornicator, or profane person, as Esau, who for one morsel of meat sold his birthright. 17 For ye know how that afterward, when he would have inherited the blessing, he was rejected: for he found no place of repentance, though he sought it carefully with tears. 1 Peter 3:8-13 -- (KJV) 8 Finally, be ye all of one mind, having compassion one of another, love as brethren, be pitiful, be courteous: 9 Not rendering evil for evil, or railing for railing: but contrariwise blessing; knowing that ye are thereunto called, that ye should inherit a blessing. 10 For he that will love life, and see good days, let him refrain his tongue from evil, and his lips that they speak no guile: 11 Let him eschew evil, and do good; let him seek peace, and ensue it. 12 For the eyes of the Lord are over the righteous, and his ears are open unto their prayers: but the face of the Lord is against them that do evil. 13 And who is he that will harm you, if ye be followers of that which is good? Revelations 21:8 -- (KJV) 8 But the fearful, and unbelieving, and the abominable, and murderers, and whoremongers, and sorcerers, and idolaters, and all liars, shall have their part in the lake which burneth with fire and brimstone: which is the second death. Revelations 22:15 -- (KJV) 15 For without are dogs, and sorcerers, and whoremongers, and murderers, and idolaters, and whosoever loveth and maketh a lie.